These door knobs are constructed from glass and come plated in satin nickel. They feature a 2in. diameter. These knobs come complete with hardware for a quick and easy installation. Glass Satin Nickel Door Knob These door knobs are constructed from glass and come plated in satin nickel. They feature a 2in. diameter. These knobs come complete with hardware for a quick and easy installation. Glass Satin Nickel Door Knob is rated 4.0 out of 5 by 22. Rated 5 out of 5 by DIYBRKLYN from I was looking for a crystal type pull for a... I was looking for a crystal type pull for a french door. It was really difficult to find with some looking cheap. This was the best and looks great. Rated 5 out of 5 by Harold from Product of good quality. Wierd that the plates tovober opening... Product of good quality. Wierd that the plates tovober opening (called rosettes) sold separately. Very fair price. 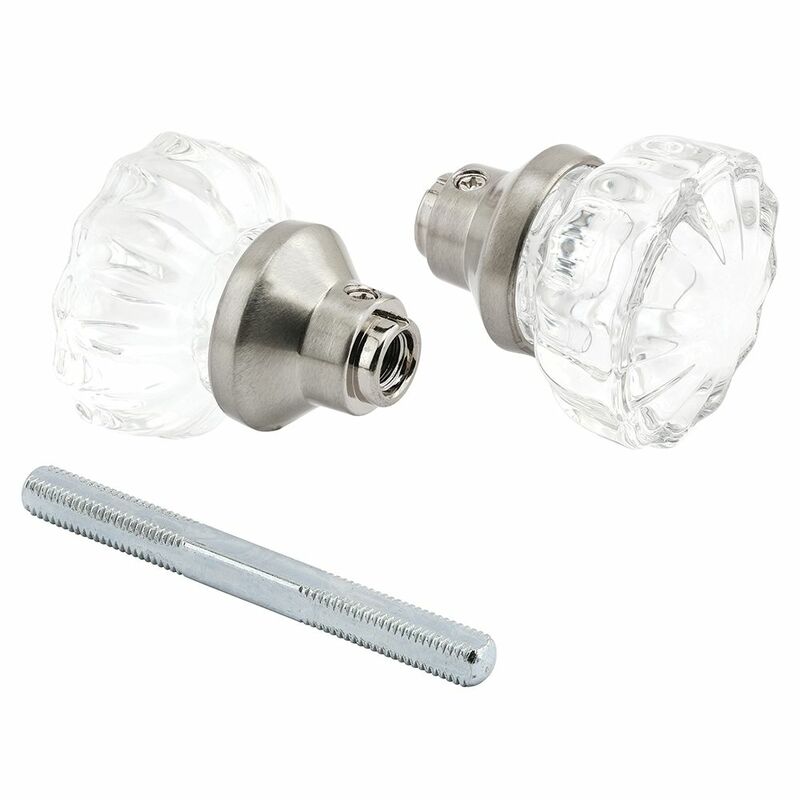 Rated 1 out of 5 by wl4536 from Screws are made of soft metal and strip easily While the knobs look nice and install easily, the screws in the metal base of each knob are made of unusually soft metal and strip very readily when turning by manual screwdriver, even well before they are tight. I have never seen screws made of such soft metal. Rated 5 out of 5 by Mike from Looks just like the originals in my house.... Looks just like the originals in my house. Rated 5 out of 5 by Vid from The nickel glass doorknob fit perfectly and it works just... The nickel glass doorknob fit perfectly and it works just as well as the original door knob did. I am very pleased with my purchase of the glass doorknob. Rated 4 out of 5 by Mabe from The product worked as designed. I would purchase again if needed. The product worked as designed. I would purchase again if needed. What is the spindle length? Thank you for your recent inquiry regarding this item from Prime-Line Products. This item is 17/64&quot; x 3-1/2&quot;L. steel spindle with 3/8 in. -20 threads.